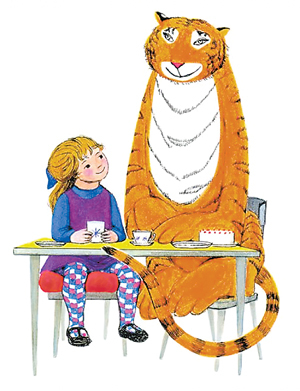 Adapted for the stage by David Wood, from the book by Judith Kerr. BBC Breakfast invited me to talk about the show and its West End summer season. Click to see the interview. Produced by Kenny Wax Ltd. and Nick Brooke Ltd. on a long UK national tour in 2008, opening at the Bloomsbury Theatre, London. A second tour began in 2011, including a West End summer season at the Vaudeville Theatre. This is a musical adaptation of the classic picture book by Judith Kerr. A tiger arrives at Sophie and her Mummy's door and invites himself to tea. He eats and drinks everything in the kitchen, including 'all the water in the tap'. Daddy returns from work and the family have an exciting drive and walk through the dark streets to a cafe, where they have a tasty supper. 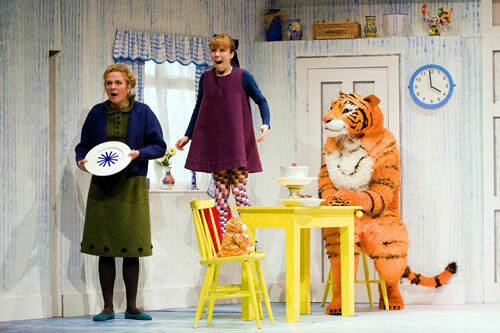 The play uses magic and illusion to create the impression that the tiger is eating everything. There are 3 actors. Sophie and Mummy, plus Daddy, who also plays the milkman, the postman and ..... the Tiger! The Stage, 10th September 2008. Birmingham Mail. 20th April 2011. Birmingham Post, 21st April 2011. 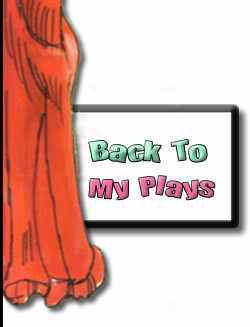 The play is as yet unpublished. All rights controlled by Casarotto Ramsay Ltd.